In recent weeks, five women have said Franken touched them inappropriately, most notably broadcaster and model Leeann Tweeden, who described him forcibly kissing her with tongue during a USO tour and “jokingly” groping her breasts for a photo while she slept. Four women have also said that Franken groped them during photo ops, including the latest, Stephanie Kemplin, on Thursday morning. (Three women say Franken groped them while taking campaign photos, while Kemplin says he touched her breast while posing for a photo during a USO tour in 2003.) 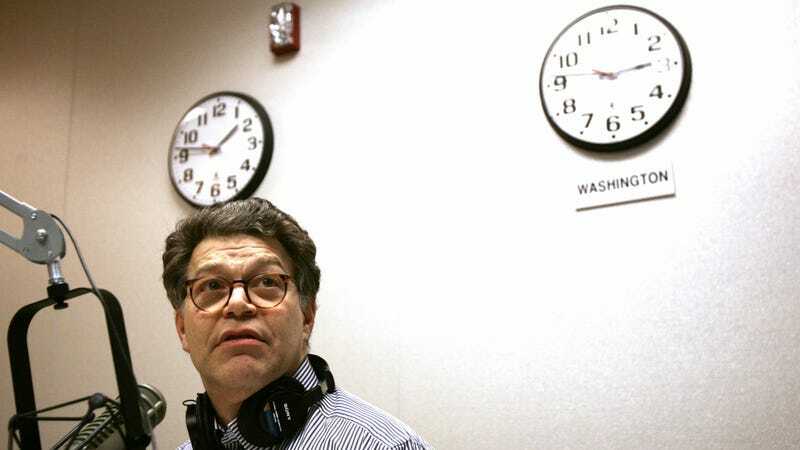 After a brief apology tour, Franken returned to work in the Senate on Monday. The New England woman told Jezebel she came forward in an effort to encourage Franken to take responsibility for his actions, but didn’t wish to be named. According to the woman’s account, she was working as the chair of her town’s Selectboard in 2006 when Franken, who was then a host for the progressive radio station Air America, came to her community. The woman was invited to appear as a guest in a live taping of his show and be interviewed in a theater in front of a large audience. Jezebel has independently confirmed that she appeared on the show. The incident happened in the spring of 2006; Franken announced he was running for Senate in February 2007. The former elected official tells us that while she’s long admired Franken’s politics, she decided to talk about the incident to encourage him to accept responsibility for his actions. Senator Franken’s press office and Franken himself have not yet responded to requests for comment from Jezebel.